Brooklin ME. A stimulating mix of intense learning and relaxed socializing in a stunningly beautiful place. Hats off to Jon Wilson and WoodenBoat magazine for pursuing a dream and creating this unique educational environment here in Brooklin, Maine, where folks from the world over could gather, work alongside and learn from many of the best and most knowledgeable professionals in the marine industry. 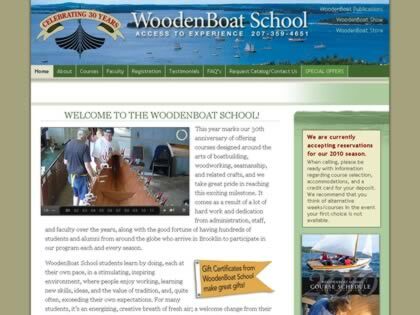 Web Site Snapshot: If available, above is a snapshot of the WoodenBoat School web site at http://www.thewoodenboatschool.com/ as it appeared when this site was added to the directory or last verified. Please Note that Boat Design Net has no involvement with the above web site; all content and images depicted in the above thumbnail are the property and copyright of WoodenBoat School unless otherwise noted on that site. Description: Brooklin ME. A stimulating mix of intense learning and relaxed socializing in a stunningly beautiful place. Hats off to Jon Wilson and WoodenBoat magazine for pursuing a dream and creating this unique educational environment here in Brooklin, Maine, where folks from the world over could gather, work alongside and learn from many of the best and most knowledgeable professionals in the marine industry.